Cassidy Williams’ career path is a great example of the importance of learning how to network and the opportunities that can come your way if you put yourself out there and create a personal brand. It’s an especially inspiring story for young women wanting to get into the tech world, a community that Williams is very active in supporting. Read on to discover how Cassidy Williams came to work at both Amazon and CodePen, why she loves side projects, and how you can discover more about her CSS art. Straight after graduating from Iowa State University, Williams joined a New York startup as a software engineer and developer evangelist and was featured as one of ‘35 Women Under 35 Who Are Changing the Tech Industry’ in Glamour magazine. Two years later, she moved to the West Coast and, this February, Amazon approached her to head up its developer voice programs. Amazon’s user experience team establishes best practices for voice design and defines the rules for voice-first applications. Every Alexa skill, for example, should pass the one-breath test. If you can say the response out loud without taking a breath, the response is probably the right length. If you need to take a breath, the user might get overwhelmed, so think about how you could shorten your response or break it into chunks as the user progresses through the flow of your skill. 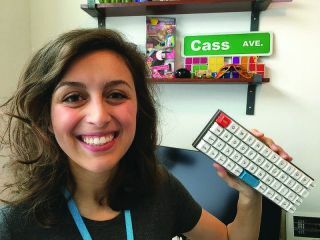 Williams co-hosted a video show, C+C Hacking Factory, with her sister Cami on Twitch and – over the course of eight episodes – they built an Alexa skill from the ground up. Although they loved doing the show, a second season is currently up in the air because, when we catch up with her, Williams has just decided to leave Amazon and move to front end developer playground CodePen. Another side project is a to-do list with a progress bar called todometer. “I built that application purely because I needed more than just a calendar to make sure I get everything done and maintain my schedule,” she explains. This article was originally published in issue 311 of net, the world’s best-selling magazine for web designers and developers. Buy issue 311 or subscribe to net. Want to learn more from Cassidy Williams on creating captivating CSS art? If you’re interested in learning more about how you can make striking CSS art, make sure you’ve picked up your ticket for Generate London from 19-21 September 2018. 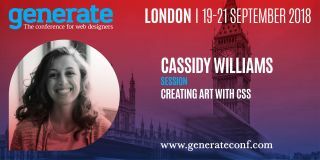 Senior software engineer making the web work at CodePen, Cassidy Williams will be delivering her talk – Creating Art with CSS – in which she will explore how creating art with CSS can strengthen your CSS skills, speed up your workflow and help you understand how designs are structured.